You can track and manage your inventory by enabling inventory tracking and defining how each product availability status affects your inventory. Select the Store Name: This setting is store-specific, so be sure to select the correct store from the drop down if you are working with multiple stores. 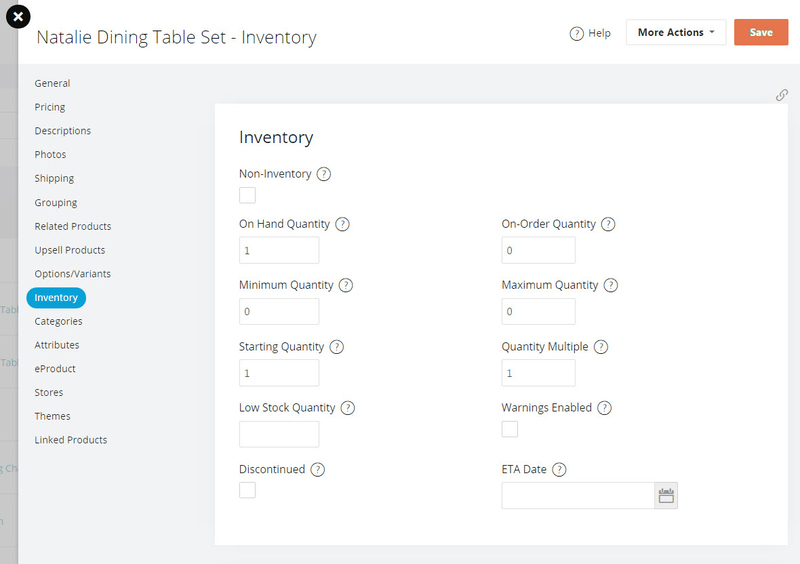 Step 2: Define how inventory is tracked and product statuses displayed when inventory changes. Beneath the track inventory option there are several important store-specific options. The first, "Remove from Inventory When," controls when items are deducted from inventory. Ordered - Inventory is removed as soon as the order is placed. Paid - Inventory is removed when the order's payment is approved. Shipped - Inventory is removed when the order is marked shipped. The remaining options control the default stock statuses that products will be set to when certain criteria are met. Default Out of Stock Status - Product will be set to this status when its stock reaches 0 and its current status does not allow back orders. Default In Stock Status - Product will be set to this status when its stock goes from less than or equal to 0 to greater than 0. Default Back Order Status - Product will be set to this status when its stock reaches 0 or below and its current status allows back orders. Default Discontinued Status - Product will be set to this status when its stock reaches 0 and the product is currently marked discontinued. This completes defining how inventory is tracked and product statuses to display as inventory changes. 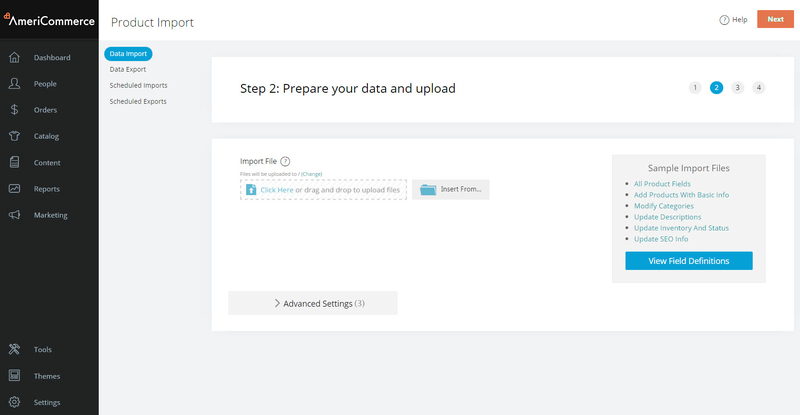 These settings can be assigned on the product editor through the admin console or imported in a .csv file through the product import tool. Stock Status – The current status of the item. This is automatically changed by the inventory system according to the settings above, but it can be changed here manually as well. NOTE: Any manual changes to a product’s stock count made from the product editor WILL NOT trigger automatic status updates. 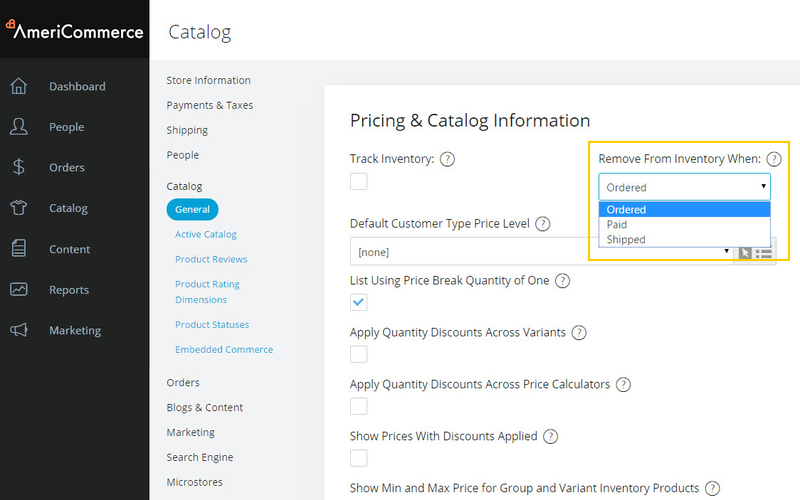 Example, If you manually change your quantity on hand from 5 to 0 your default status will not change to 'Out of Stock' automatically (as defined in your inventory status changes in Step 2); This is to avoid conflict if you may have made a manual change to your product status on the product editor. To avoid conflicts and to give you complete control over the product status through the product editor, the status change will not trigger automatically. Discontinued – If checked, this item’s status will be set to the default discontinued status when its stock reaches 0. Min Qty – The minimum quantity of this product that can be ordered. Max Qty – The maximum quantity of this product that can be ordered. Non-Inventory – If checked, inventory will not be tracked for this product. On Hand Qty – The current stock count for this product. To display on hand quantity on the product details page, the setting needs to be enabled under Themes > Active Theme. Please click here to read the article on how to enable this. On-Order Qty – The amount of this product currently on order. The available quantity of a product is the On Hand Qty + the On-Order Qty. 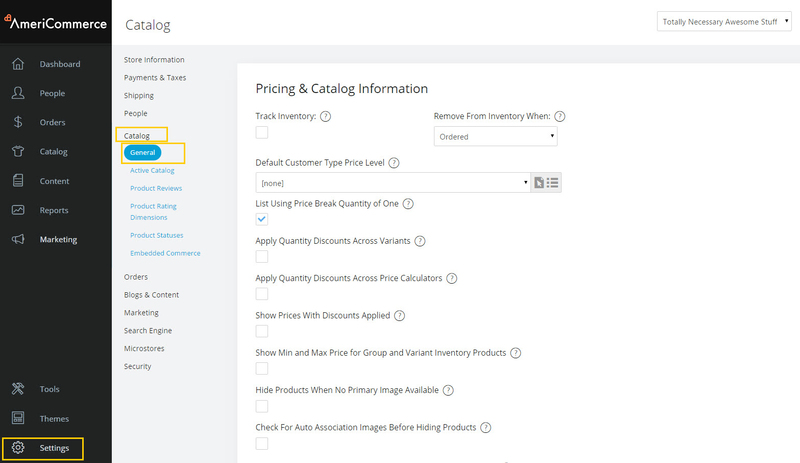 Inventory can be edited en mass via the Product Import (Tools > Data Import > Product Import) or by using the Inventory Editor (Catalog > Inventory Editor). Product Import Tool: You can adjust inventory count by using the NumberInStock column on the Product Import spreadsheet. If you would like product status changes to be triggered on import based on status changes defined in Step 2, you need to select a store in the import setup process. select the Store in the import setup process if you would like product status changes to be triggered based on "NumberInStock" being imported. I just wanted to say that I absolutely love that the actual logic is laid out for how the stock statuses get used or for how they come into play. That's exactly what a help file should do in order to be helpful! Love it! If an order is canceled (or deleted), how does Americommerce handle returning the inventory from the canceled order back to the store? or does it? Same question as above - when order status is changed to "cancel order" or the order is deleted, it doesn't look like the inventory is being returned. I'm guessing that the next sync will take care of it (running a test now to confirm) but if the cancelled order was for the last item in stock, I hate leaving it out of stock until the next sync. Is there more info on the process of a cancelled order? How doe the customer get refunded in addition to the inventory questions above? Thanks! I want to tinker with Inventory -- by just setting up one item. :) I have a few hundred items on my catalog and don't really want to bother with those yet. Do I need to export my entire catalog and reimport them as NON-INVENTORY items, turn on Track Inventory and then adjust the one item I want to "test" with?